The top of the pile was a purple box in which I kept my Playbills, ticket stubs, and other "See, you leave the house sometimes" paraphernalia. Well, the box with the Playbills had long ago exploded as I kept putting more things in there and I was looking for a storage option. My friend Jess mentioned that Playbill.com was having a sale on Playbill binders--they are heavy duty binders with plastic archival sleeves meant to keep your Playbills in place, unfaded. The binders I got take about 24 Playbills each. I had to get two Playbill binders and there are still a few outliers I ran out of space for. But now everything's all organized! Then my cousin mentioned that he owed me a birthday gift, I asked him for two organization bins. 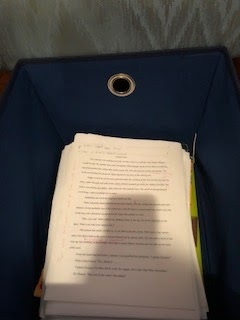 So now all my "papers" are in the bigger bin. I may or may not geek out when it comes to organizing.